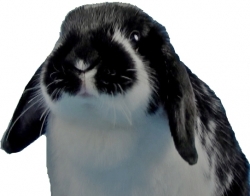 Fans of rabbit comedy web series Rabbit Bites will be glad to hear that pet food maker Purina has renewed its sponsorship at 300% of its previous rate. The partnership will last at least through the year, paid at a per-episode rate, so don’t expect to see Buns or Chou-Chou on tabloid covers for debauched parties anytime soon. For those of you who didn’t quite catch that, the good news is that one of his upcoming projects is a retrospective that “will visually display more insight into the meaning of rabbit bites”. Rabbit Bites is an incredibly surreal comedic look at popular culture through the eyes of bunny couple Buns and Chou-Chou. Highlights include episodes about Dateline NBC’s To Catch A Predator and American Idol as well as a host of special guests, including MadTV comic Bobby Lee, actor David Alan Grier, and web personality Chad Vader. The show is currently available on YouTube, Revver, and Salon.com’s Video Dog section. We last covered Rabbit Bites back in Decemeber when it made our Tuesday Picks, and, trust me, you haven’t lived until you’ve seen Bobby Lee come on to a rabbit.